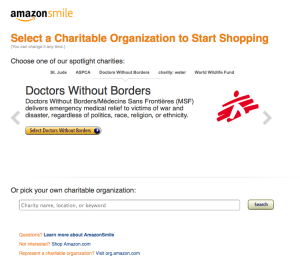 Every time you make an eligible Amazon Smile purchase, Amazon.com will donate .5% to the charitable organization of your choice. 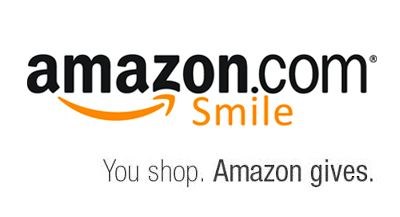 By letting Amazon.com know that you would like that donation to go to Broken Chains Ministry, you’ll be helping to continue our ongoing outreaches and interventions with your online shopping. While this small contribution may not seem like much from one person, purchases from all of our supporters help to create a greater momentum throughout the year. The more people donating in this way helps to make the greater impact. 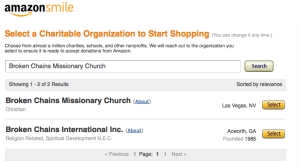 PLEASE NOTE: By linking your Amazon.com account to Broken Chains Ministries Amazon Smile account your transaction history will NOT be seen by us, or tracked by our organization. We simply receive a monthly contribution amount from Amazon.com providing us with the donation percentage from qualifying purchases. In other words, we don’t see anything, nor do we track your purchases. We don’t even see who donated which amounts that were given to us through this platform. 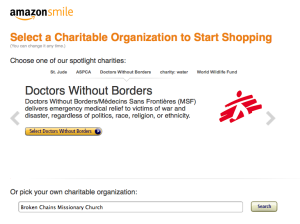 We value and respect your privacy and want you to know this before you consider donating to us through AmazonSmile. To direct your purchases on Amazon.com to benefit from the Amazon Smile donation program, you need to have an Amazon.com account you use for purchases through their online store front. If you do not have one, you can sign up for free at Amazon.com. 1. With your Amazon.com username and password in hand, go to smile.amazon.com and Sign In. If you are already logged onto Amazon.com you will not need to go through this step and can advance to step 2. 2. Once signed in, make sure your browser address bar is at smile.amazon.com. If not, type this into your address bar. This is generally at the top of your browsing window. 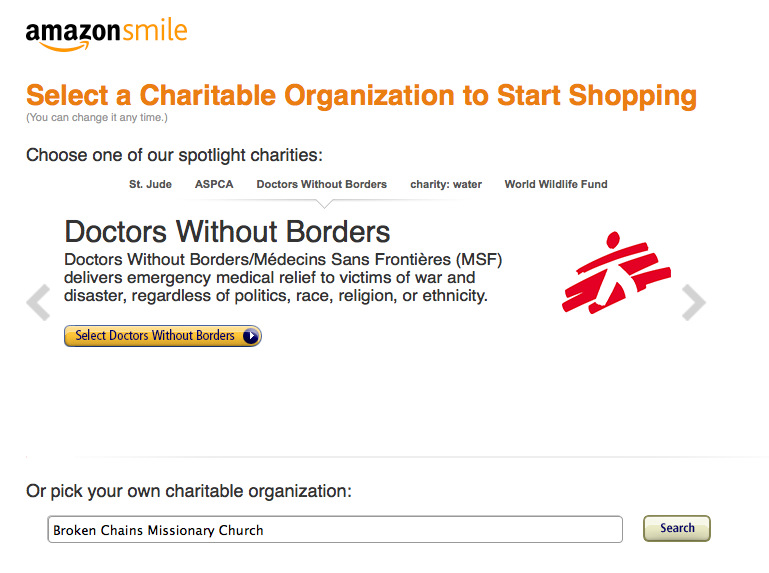 If this is the first time you have logged onto smile.amazon.com or have never chosen your charity of choice, your screen will look similar to this. 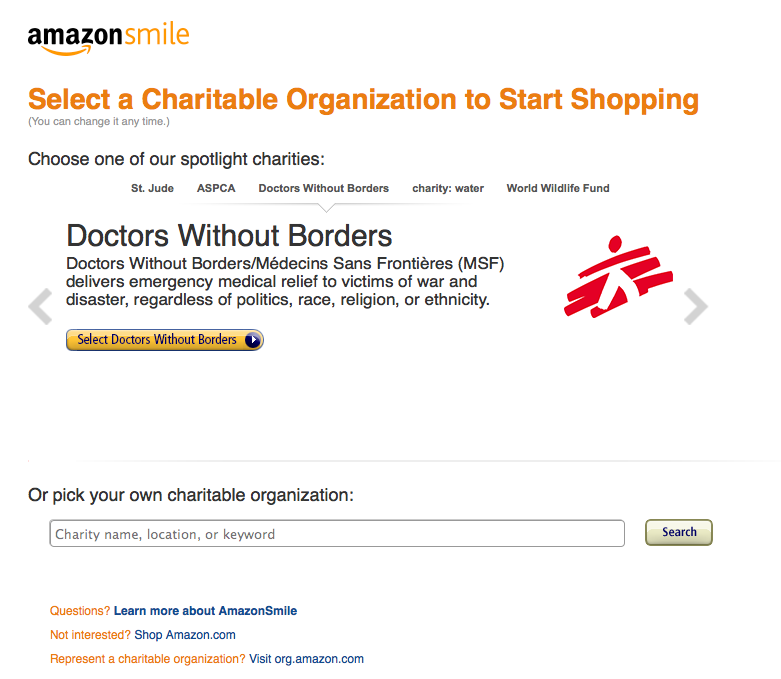 By default most people will see Doctors Without Borders chosen even though they have never made that selection. 3. Select the entry form below the text that says “Or pick your own charitable organization:” In this field type in our official IRS 501(c)3 organization name which is “Broken Chains Missionary Church” and then click on the tan search button to the right. 4. Your search results will come up with at least two results. The way to determine the right one is to select the one with Las Vegas, NV to the right of the Organization’s official name. 5. Once you have found the right one, press the orange “Select” button to the right of our name and location. 6. After selecting Broken Chains Missionary Church, you will be directed immediately to your Amazon.com account with a pop-up that will confirm your selection that looks similar to this. That’s it! You’ve completed the process. Anytime you log in to purchase from Amazon, just make sure to go to smile.amazon.com instead of amazon.com. 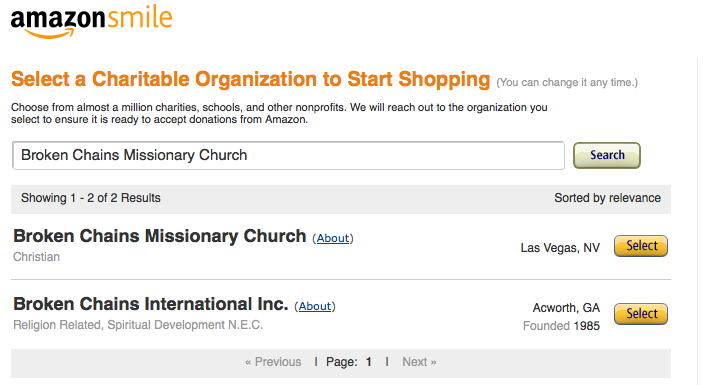 That way Amazon.com will know that you want the contributions they make from your purchase to go to Broken Chains Ministry. If you sign into Amazon.com, you will be notified with a pop-up window reminding you of this. That way you’ll know that you’re helping us out with purchases that qualify for the Amazon Smile program. To find out about other ways you can give to or volunteer with Broken Chains Ministry visit our Be A Part page.